Practicing singing regularly is a simple and fun exercise for enhancing well-being and cognition. Learning new songs, experimenting with your voice and learning to read music can all help to develop coordination, improve concentration and memory, enhance creativity and can even increase your IQ. Lessons can provide a great workout for your lungs and can improve your posture as you will learn how to hold your body correctly in order to develop your technique. Research even suggests that singing can boost the immune system. In a study from the University of Frankfurt involving professional choir members, it was found that after an hour-long rehearsal of Mozart’s ‘Requiem’, the amount of proteins in the immune system that function as antibodies (known as Immunoglobulin A) were significantly higher after the rehearsal for most of the choir members than before the rehearsal. Musical Theatre provides a safe and non-judgemental platform for young people to develop their identity, express themselves creatively and truly come out of their shells that children often find difficult to break. 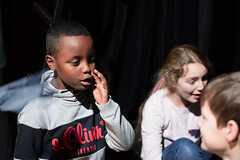 Performing to an audience-whether to your LAMDA examiner or a full audience- will help to improve confidence and prove to children that they are more than capable of tackling some of the most daunting exercises. Even the most reserved children can find Musical Theatre to be a great outlet for being more outspoken and confident through taking on new characters that they feel safer to express themselves in. Being involved in Musical Theatre will require you not only to turn up to rehearsals and classes on time but also to take away what you have learnt in class and to practice your lines and songs off by heart at home. Not matter how big or small your part is, you are working as part of a team and so it is important that you are committed to learning your part and lines in order to support the smoothness of the production and the roles of your fellow performers. There’s never been a more thrilling time to be involved in Musical Theatre, with popular shows such as Hamilton storming the Westend and Broadway. But, being involved in Musical Theatre is generally a super exciting place to be when you are young and figuring out who you are. You’ll get to learn the parts and songs of your favourite musicals and be introduced to completely new inspiring stories and adventures. You’ll be kept motivated and on your toes each week, always eager to progress and to achieve more. You’ll also get to experience the incredible feeling of taking that final bow and acknowledging everything that you have learnt alongside the lifelong friends that you met along the way. Hello Kelsey! When did you first become interested in Musical Theatre? I grew up in a very musical family. Both my Dad and Grandma love to sing so music was always around. I used to watch golden age musicals with my Grandma all the time while we cooked, things like South Pacific, My Fair Lady, and Singing in the Rain so it’s always been a part of my life. The first chance I had to participate in musical theatre was when I got to high school and I jumped at the chance to be on stage. The musical theatre classes at PYT began in February, how is it going so far? It’s going great! It’s been very fun so far. How do you prepare for the classes? I prepare differently for each student. Generally we agree on two to three new goals per week, we work toward it and create new goals. It’s a very collaborative process. How valuable do you think the classes will be to individuals? I think the classes are very valuable to the students. It is the first time working on musical theatre and music and signing in general for many of the students so it’s an opportunity for them to try something new, and expand their love of theatre and acting while also adding singing as a new skill. For some of the students they have studied before and this is an opportunity for them to continue to grow and work on musical theatre. Best thing about teaching Musical Theatre to young people? Noticing their progress from week to week and seeing how much they grow. And also their excitement when they are working on something they really enjoy. Any tips for anyone considering the classes but might be feeling a little bit shy? Just give it a try! You might be surprised at how much fun it can be. If you would like to learn more about the LAMDA Musical Theatre classes that we offer, visit our Weekly Courses page on our website or send us a message here. We look forward to hearing from you!